Acne and Pimples are the most common skin problems that most of us face. While, it is very obvious to have acne and pimples during the teenage years due to the hormonal changes in the body, that generally go away with age, acne and pimples that comes in adulthood is the bigger concern and needs to be treated. For many of us, the problem of pimples becomes a permanent issue and that is when it starts becoming a thing of major concern. And, not just that, pimples can actually be very painful if you accidentally scratch them. It may start bleeding and take a lot more time to heal. Even if they heal, many a times, they leave ugly marks on your skin that simply refuses to fade. In short, pimples are one of the worst skin enemies that can easily ruin your day. However, there is one very effective natural ingredient that can be used to treat pimples once and for all and that natural ingredient is Aloe Vera. Today and I am going to talk about everything worth knowing about using aloe vera for acne and pimples. I am also sharing 8 of the easiest and most effective remedies to treat pimple with aloe vera. If you are tired and frustrated due to pimples and acne and wondering how to treat and get rid of this skin enemy fast and naturally, then aloe vera is the go to ingredient. Aloe vera is considered to be the magical natural ingredient that can do wonders to your skin, hair and even internal body parts. The best part is that aloe vera is edible and it can be consumed for various health benefits. But today in this post, we are going to focus on how to treat pimple with aloe vera. Today, all of us have become conscious about how we look and frequently appearing acne and pimples can really become a frustrating skin issue. There are many who feel depressed and low confident due to these ugly pimples. After all, it is a struggle every day to look beautiful for someone with severe breakouts in his/her face all the time. No matter how much we emphasis on the fact that beauty lies within, the truth is when you look into the mirror and see a face full of pimples, it sure is very depressing. However, pimples are not something that can’t be treated and with natural healing ingredients like Aloe Vera. Aloe Vera is very potent in treating pimples but we must know how to make the best use of it in order to reap the maximum benefits out of it in treating pimple and acne. Research has been done on Aloe Vera and it has been proven to have a lot of benefits and that includes skin benefits as well. But, how does it help to deal with the problem of pimples? What are the nutrients present in Aloe Vera that makes it so effective against pimples? We have discussed it all right here in the post, so read on. Why Aloe Vera help treat pimples so effectively? Aloe Vera is a magical natural ingredient for treating a whole lot of skin problems including acne and pimples. Probably that’s the reason why it is used in a lot of skin care and beauty care products. Aloe Vera is antibacterial in nature and that itself is a big factor behind its ability to treat pimples, acne and redness caused due to it. It basically inhibits bacteria from infecting the area and speeds up the healing process. Besides, being antibacterial in nature, Aloe Vera is also antifungal which helps to reduce the inflammations in your skin like for example cysts, boils etc. Aloe gel contains magnesium lactate which aids in alleviating the itchy feeling caused by the pimples. It also helps in the treatment of skin rashes and sunburns. Aloe vera has astringent properties that are highly beneficial in removing the excess dirt and oil from your skin which in turn, helps in the prevention of the pimple and acne breakouts. It is also effective in reducing the size of the inflamed nodules and cysts, and relieves you of the pain caused because of the swelling. The best thing is not only it reduces the pimples but aloe vera is also effective in reducing the scars by promoting the regeneration of your skin cells. This is possible because of the presence of anthraquinone in Aloe that invigorates your skin and boosts the development and restoration of the skin cells. Thus, when you use Aloe, your skin become flawless and radiant. Aloe Vera is also very effective against skin pigmentation which also helps to reduce the appearance of the blemishes and the scars caused by the pimples. Saponins like mannans, gibberellin, and polysaccharides are present in Aloe Vera that kills the bacteria and viruses like Propionibacterium that is instrumental in causing pimples and even severe acne. Aloe plant also contains salicylic acid which is actually a compound which unclogs the blocked pores and eliminates the pimples, whiteheads and blackheads. It is also helpful in regulating the pH balance of your skin. When there is too much of the accumulation of dirt on your skin, it clogs your pores and leads to bacterial infection and formation of blackheads. But, when you apply Aloe Vera on a regular basis, it keeps the pores tightened and decreases the exposure of pores to the pathogens. So, these are the reasons why Aloe Vera is considered to be so good in treating pimples, acne and whole lots of other skin issues. Now, that you have learned about the reasons lets us start our discussion on the easy and effective ways to use Aloe Vera to treat pimples. Aloe Vera is proven to be very soothing and relaxing for your skin. It helps deal with the various skin problems including pimples, the skin disorder that can be very frustrating to deal with. However, you need to use the Aloe properly and diligently to get the maximum benefits in treating pimples. And, the best way to treat pimples with aloe vera is to mix it with other skin healthy ingredients to intensify the good effects of aloe vera. When you mix the right ingredients in a remedy and use to treat pimples, acne or any other skin disorder, you get magical benefits. Listed below are the easiest but the most effective ways to treat pimples with aloe vera. The combination of other healthy ingredients can certainly make the effects great, but you can use the magical ingredient Aloe Vera all alone as well. Pure and fresh aloe vera gel is equally capable of treating pimple and as far as the reasons are concerned, you already know why. So, you can use pure and fresh aloe vera gel to treat pimples. How to use: You should extract the fresh and aloe vera gel from the aloe leaf. But if you don’t have the aloe vera plant or leaves, then you may like to buy pure aloe gel. In order to extract the gel, you need to cut a good-sized leaf from the Aloe plant. The leaf should be about 5-6 inches long. Wash the leaf properly in water and then cut it in half lengthwise using a knife. After that, scoop up the gel as much as possible with a spoon or a knife. Now you can apply this pure and fresh aloe vera gel on your pimple infected skin portions. Keep it for around 25-30 minutes and then wash it off. If you want, you may even keep it overnight and wash it off the next morning. But avoid getting exposed to direct sun light with aloe vera gel on your skin. Aloe vera is totally natural ingredient, but still some of us may be allergic to it and so to be double sure whether Aloe gel suits your skin, you may like to do a patch test. Apply some gel on your wrist, let it dry and then wash off after 30 minutes or so. If you see no reddening then feel free to apply the gel on your face. This is actually recommended for safety purposes. Although Aloe suits maximum skin types, it may still not suit you. So, it is better to do a bit of checking before applying it on your skin to treat pimples, acne or any other skin issue. The reason why it is recommended to use honey along with Aloe Vera is because honey is an amazing antibacterial agent and it contains a number of antioxidants. Application of honey helps in rehydrating the skin, which in turn, helps to keep the excess sebum production under control. In fact, not just pimples and acne, the incredible cleansing and healing properties of honey are very effective in solving other skin issues as well, and studies are a proof of that. So you can use honey along with the magical Aloe Vera to treat pimples naturally and easily. 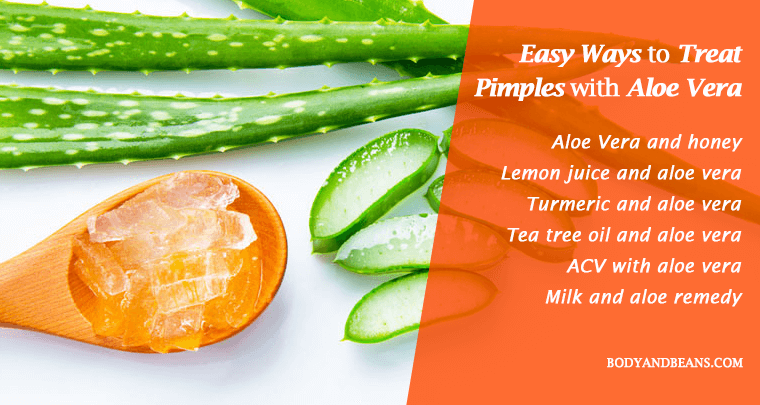 It is very beneficial for treating pimples and if you apply this remedy correctly, I am sure you will get positive results in treating pimples with aloe vera after a few applications. And to make this remedy even more effective and beneficial in treating pimple, you can add rose water to it because rose water will further improve the good effects. In fact, if your skin has become a little dull, you may even add a pinch of turmeric to get that brightening effect. Preparing and using honey and aloe vera remedy to treat pimples is easy. Take around 1 tablespoon of Aloe Vera gel, 1 tablespoon of honey and around 1-2 teaspoons of rose water and mix it well to make a paste. All you have to do now is to apply this natural paste on your pimples. Keep it on your skin for about 20 minutes and then wash it off. Use this mask for about 3 times on a weekly basis, and I am sure that you will be highly benefitted in treating pimples. The antibacterial properties of both Aloe Vera gel and lemon juice are very effective in treating the pimples and preventing further occurrence of the breakouts. The lemon juice cleanses and purifies your skin off all the dirt and the impurities and also tightens the pores of your skin and prevents them from getting clogged. However, lemon juice alone can dry up your skin. But when used with Aloe Vera, aloe actually takes care of the moisturizing and the soothing part. Hence the combination works great against the pimples. However, if your skin is sensitive, then it is recommended that you use tomato juice instead of lemon juice, as tomato juice is comparatively milder than the lemon juice. Take around 1-2 tablespoons of Aloe Vera gel and a few drops of the lemon juice. Add the two ingredients together and mix them well. Apply this mixture on the pimple affected areas of the skin, and allow it to stay overnight. If you are not comfortable with that (because the mixture may appear to be too sticky), then let it stay for about an hour and then rinse it off. Do this on a regular basis to treat the pimples fast and naturally. One of the easy and effective ways to use Aloe Vera to treat pimples is by using it with the potent herb turmeric. Turmeric is antimicrobial in nature which is very useful in killing the pimples and acnes bacteria while its anti-inflammatory properties are instrumental in reducing the swelling associated with the pimples or the acne. It also contains antioxidants that accelerates the healing of the pimples and prevent the formation of the scars. So, when you combine both the ingredients, you actually get faster results in treating pimples and acne. Take around 1-2 teaspoons of Aloe Vera gel, half teaspoon of turmeric powder and about 1 teaspoon of gram flour or chickpea flour to maximize the benefits of this remedy. Mix all the ingredients till becomes like a smooth paste. In case the paste becomes too thick, feel free to add the required amount of water. Now, apply the mixture on the pimples. Leave it for about 15-20 minutes and then rinse it using water. If you repeat the remedy for at least 2 times on a weekly basis, then I am sure you will be able to treat pimple within a few weeks. The only problem with using turmeric in this remedy is that it stains your skin yellow. For that, you may rub lemon juice gently on it and get rid of the yellow stains off the skin. This essential oil with its antimicrobial properties kill the bacteria and the fungi present in the skin and helps prevent the occurrence of pimple breakouts. It is also anti-inflammatory in nature and that helps to soothe the swelling skin. So if you have oily skin, using tea tree oil is very good because it keeps the sebum production under control that automatically reduces pimple occurrences. However, tea tree oil doe sometimes causes rashes on a sensitive skin but when you use it with the soothing Aloe Vera, its effects get milder. Still, I will recommend you to do patch test in case you have the sensitive skin and thus become sure that it is suiting your skin or not. Take around 2-3 teaspoons of Aloe Vera gel and around 3-4 drops of tea tree oil. Add the two ingredients and mix them well. Now apply the mixture on the pimple infected areas of your skin. Leave it nightlong and wash your face the next morning. Use the remedy every night before going to bed to treat the pimples easily and naturally. If you have got a normal skin, then you can definitely try out the apple cider vinegar and Aloe Vera remedy to treat pimples. The reason why the apple cider vinegar is often recommended along with Aloe Vera for treating pimple is because it is rich in malic acid that acts as an astringent on your skin. It helps you remove all of the bacteria from your skin and makes the pH level of your skin normal. It also helps in the process of exfoliation of your skin and get rid of all of the dead skin cells that have accumulated in the pimples. Take 1 tablespoon of Aloe Vera gel, half teaspoon of apple cider vinegar and half teaspoon of water. Water is used to dilute ACV and also to make a nice paste by mixing all these ingredients. Once you have made a paste out of them, apply the mixture all over the pimple affected skin using either a cotton ball or your fingers. Allow it to dry for about 15-20 minutes and then wash it off your skin. This is a great remedy for treating pimple with aloe. If you use this remedy once or twice every week, you will see the magical improvements in your skin conditions. However, using apple cider vinegar is not recommended to someone with sensitive skin. Therefore, if you have a sensitive skin then you may skip this remedy and try other ones. One of the most effective ways to treat pimples with Aloe Vera is by adding it with milk and sugar. Milk is a great soothing and cleansing agent and thus it purifies your skin off all the dirt and the impurities. It also keeps the skin hydrated. Sugar, on the other hand, is a humectant and it allows your skin to stay hydrated for quite a long time. You can say it enhances the hydrating effects which reduces the production of the sebum. Sugar also contains glycolic acid that helps in cell turnover. And hence you can use both of these with the magical aloe vera to treat pimples naturally. Take around 1 tablespoon of sugar, half tablespoon of milk and around 2 tablespoons of Aloe Vera gel. Add the sugar to the milk and mix until the sugar gets dissolved in it completely. Now, add the aloe vera gel and mix it again to form a paste. Apply this mixture on your pimples and let it stay for about 15-20 minutes. Rinse your face using lukewarm water. Do this on a regular basis to treat pimples with aloe vera easily. However, it is advisable that you avoid the Aloe, milk and sugar remedy in case you are allergenic to milk. Over to you: how do you treat pimples with aloe vera? Well, Aloe Vera is definitely a wonder ingredient as far as skin and hair care goes. It is used in several skin and beauty care products. Aloe vera has been used in a number of remedies as well to treat various types of skin and hair issues. And, why not, it has every property that is needed to cure majority of the skin and hair issues. Starting from being anti-inflammatory in nature to being antimicrobial to being a great cleansing agent to moisturizing and hydrating the skin beautifully to having the soothing and cooling effect on your skin, aloe vera provides overall protection to your skin and it’s been effective in treating different skin complications. Now, pimples are undoubtedly the most common skin issue and sometimes, they refuse to heal easily and create permanent scars on the face. In such a case, Aloe Vera is recommended because it can not only heal the pimples fast but will also remove the scars and prevent the occurrence of pimples again. Aloe itself is good enough to take care of the pimples. But at times, when the pimples are too stubborn, then it is advisable that you mix it with the other potent and healthy ingredients to intensify its goodness. I have already mentioned about various remedies and ways to treat pimples using aloe vera. The ingredients used are all natural, so they are safe to be used on the skin. And, if your skin is sensitive, then don’t ignore the patch test first before directly using the remedies on your face. However, besides using Aloe Vera gel in different ways, if you want to treat pimples effectively, then it is important for you to lead a healthy lifestyle. 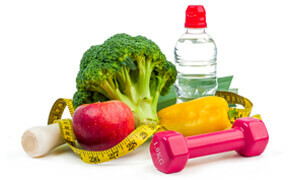 Like for example, eat healthy and balanced diet, sleep well and exercise regularly. This will balance the hormonal changes in your system which often causes the pimples and acne. In short, the more disciplined you become, the more beautiful you are going to be inside out. So, that is all I had to share for today on how to treat pimple with aloe vera fast and naturally. Have you used aloe vera to treat pimples and acne? I would like to know about the other remedies and ways to treat pimples with aloe vera. And as always, feel free to share your feedback and suggestions. Suggestions are always welcomed. However, if you have found the post to be valuable, please do like, comment and share it with others who may benefit. Until then, stay beautiful and do not let those ugly pimples ruin your day.